The scholarship honors Pat Tillman. In 2002, Tillman, a starting safety for the National Football League’s Arizona Cardinals, put his football career on hold to serve his country. Family and friends established the Pat Tillman Foundation following Pat’s death in April 2004 while serving with the U.S. Army’s 75th Ranger Regiment in Afghanistan. The foundation invests in military veterans and their spouses through scholarship and programmatic support, and is dedicated to building a diverse community of leaders committed to service to others. 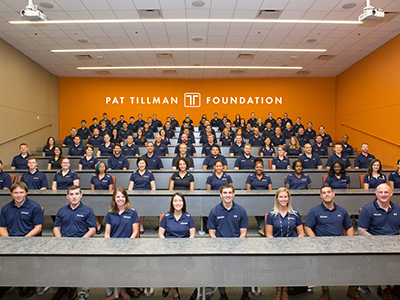 Syracuse University was selected as a Pat Tillman Foundation University Partner in 2016 after an extensive evaluation process. University Partners are chosen for their demonstrated commitment to supporting military veterans and spouses on campus. The Tillman Scholarship can play a significant role in helping student veterans and veteran spouses achieve their academic and professional goals. Beyond funding for academic expenses, the scholarship provides significant networking, leadership and service opportunities. Applications must be submitted by March 1. Finalists will be asked to submit additional materials and will be interviewed by the Pat Tillman Foundation.